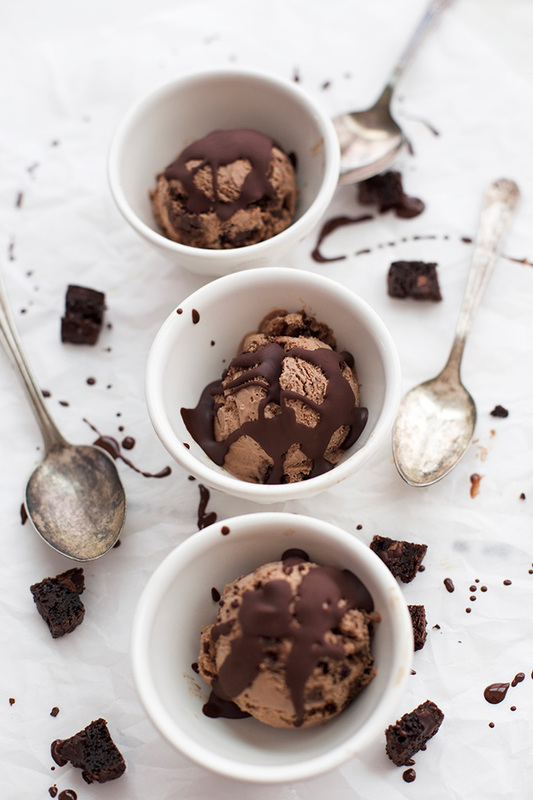 Dairy free fudge brownie ice cream. It’s chocolatey and rich and delicious without a touch of dairy. Dreams come true friends. Dream comes true. One of the great experiments I’ve enjoyed this summer is testing out different dairy free ice cream methods and recipes. It’s been a really delicious summer, so far. We’ve tried dairy free salted caramel, pistachio, and have been playing around with berry flavors. But we’d be remiss in our research if we didn’t tackle chocolate. And boy did we ever. 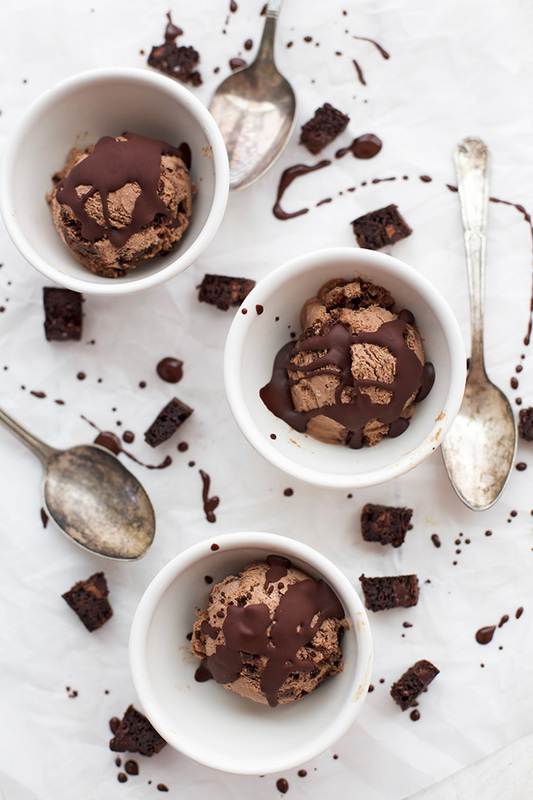 This Dairy Free Fudge Brownie ice cream is amazing–chocolatey and decadent without being too heavy or rich. Perfect for enjoying on a hot day! 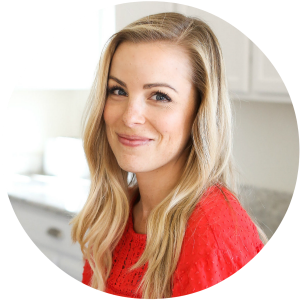 There are definitely a few things I’ve learned along the way when it comes to dairy free ice cream…one of the most important is that a combination of milks keeps one from taking over the other. The recipes I’ve tried that use only coconut milk taste like, well, coconut. It doesn’t matter if it’s supposed to be peach ice cream, or cherry chocolate chip, or caramel swirl. If it’s made with all coconut milk, the taste of coconut milk will compete with or drown out the other flavors. The great benefit of coconut milk is its natural supply of healthy fats. Fat is an essential component of ice cream, so I don’t like to remove it entirely. I use a combination of coconut and cashew milks or coconut and almond milk and, magically, the other flavors in the ice cream (lemon, chocolate, mint, etc.) are given center stage. 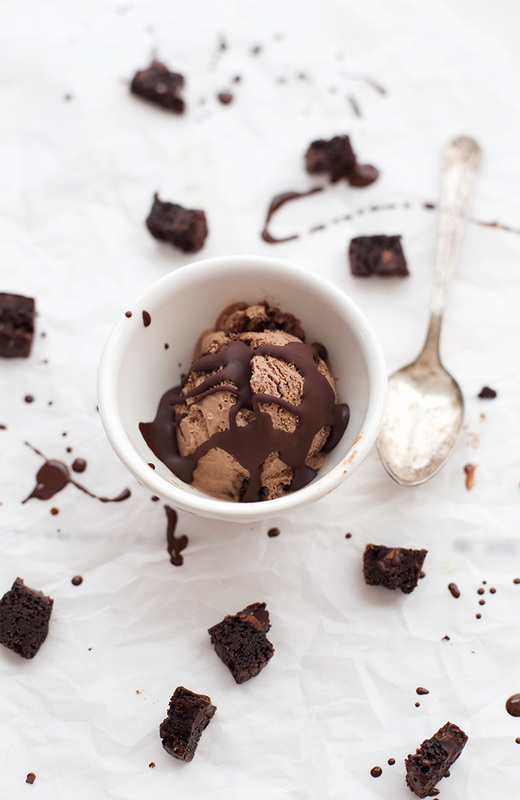 I’ve been playing with several flavors this month, but this fudge brownie is just right for us. I kept the chocolate base a touch less sweet, knowing the brownies would add sweetness and we planned to serve it with a magic shell/chocolate sauce topping that would all be very sweet. We each tasted the ice cream mixture before I poured it into the ice cream maker and it was AMAZING as is. So good. We found gluten free ice cream cones at Sprouts, and the kids were SO excited for ice cream cones (I was, too!). So, once it came out of the ice cream maker, we all had another spoonful (for science) before popping it into the freezer to get a little more firm. Every single stage was delicious! It was fudgy and decadent without being too rich or heavy. Exactly what I was looking for! Now, I just need to get nail down my other recipes! The best ice cream maker. I absolutely love this ice cream maker. We’ve had it for seven years, and it’s still going strong. Very easy to use and doesn’t take up as much cupboard space as some other models. Let’s talk brownies. If you’ve got time, I highly recommend making your own brownies. They’re divine. This is our favorite recipe for gluten free brownies, and this is our favorite from before our diet changed. If you need a vegan recipe, this one looks divine (though I haven’t tried it yet). Freeze time. 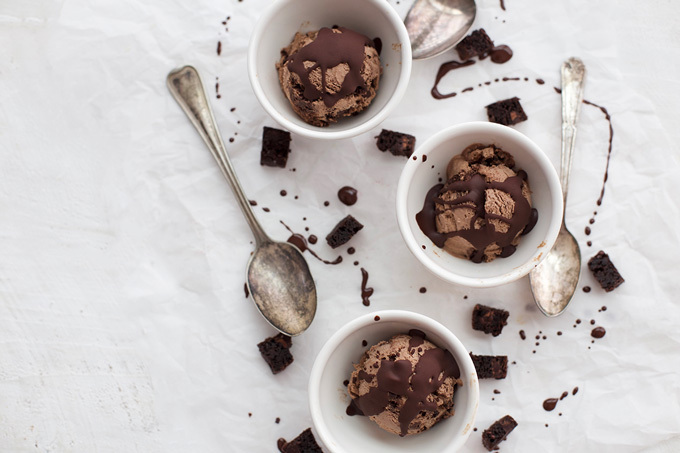 One sad thing about dairy free ice creams (homemade or store-bought) is that they tend to freeze harder and more solid than dairy ice creams have in my experience. Straight from the ice cream maker, this will be like gorgeous soft-serve. If you pop it into the freezer for 1-2 hours, it’ll be just about right for scooping. Once it approaches the 3 hour mark, it starts getting hard, and you’ll need to let it sit out a few minutes before scooping. Ice cream is always a bit of a time juggle (trying to get it to be finished when you’re ready to eat it), but take that into account when you’re factoring your time. So, about the gelatin…One ingredient that might be new to you is the gelatin. I use this grass-fed beef gelatin (it’s not beef-flavored, just made from beef bones). That might sound a little crazy, but there’s quite a bit of research that supports high-quality natural gelatin and collagen sources as a very healthy element of our diets (think the benefits of bone broth). If you’re vegan, this obviously won’t work for you. Its purpose in the recipe is to act as a smoothing and binding agent that creates a really velvety texture. If you are vegan or choose to avoid beef, you can instead add 2 Tbsp cornstarch to the mixture to help bind it together. The results aren’t quite as velvety, but it will do! The ice cream base will need to chill completely before you add it to your ice cream maker. You’ll want to allow several hours (4-6 at least) for the mixture to get very cold. I like to mix up the base the night before. Combine coconut milk, almond or cashew milk, dates, cocoa powder, vanilla, and salt in a blender. Puree until completely smooth. Add gelatin dissolved in water and pulse to combine. Transfer mixture to a covered bowl or container and refrigerate at least 4-6 hours (or overnight if you can) to completely chill. If using gelatin, the mixture will be quite thick and will look like a mousse. When mixture is completely chilled, transfer to your ice cream maker and churn according to manufacturer’s directions. In our Cuisinart, this takes 20-30 minutes. Mixture will be like thick soft-serve ice cream. Stir in brownie bits. Eat immediately as soft-serve, or transfer to an airtight container and freeze 1-2 hours, or until you can form scoops. If your ice cream is too hard to scoop, let it sit out 10-15 minutes, or until soft. Make your chocolate shell. Microwave chocolate chips and coconut oil or melt in a saucepan until very smooth. Pour over ice cream before serving. It will immediately harden on the cold ice cream. So good!